Happy Friday everybody! Put away that spreadsheet, because I'm about to ruin any chance of having a productive work day. YouTube has quietly released an animated GIF-making tool that let's you meme-ify video clips from the site, complete with text and an easy way to share and embed them. We have no idea if this feature is just a pilot that could disappear soon or the beginning of something much bigger. But it is publicly available for anyone that wants to try it out. We've asked Google for more information and will update this story should the company respond. The impact on you at home: Creating an amusing animated GIF or choosing just the right GIF for a blog comment is already an art form online—so much so that it's surprising YouTube didn't come out with this sooner. 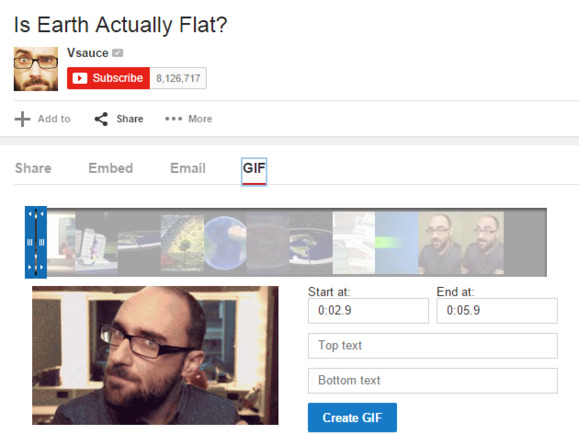 We've already shown you how you can make a high quality GIF with a photo editor, but YouTube's new feature (assuming it sticks around) is far easier to use. With this new feature YouTube could become the go-to source for creating GIFs online. The new GIF feature—first pointed out by Gizmodo—doesn't work with just any YouTube clip; it has to be enabled on a user's channel to work. It appears there are several accounts you can use for GIF-making pleasure at this time, including Epic Rap Battles of History, Good Mythical Morning, PBS Idea Channel, vlogbrothers, and Vsauce (thanks Reddit). Once it's done you can embed the GIF in a website or blog, or use a direct link to share it or download it to your desktop. You can also save a GIF the same way you would any other image you found on the Internet. Happy GIFfing!